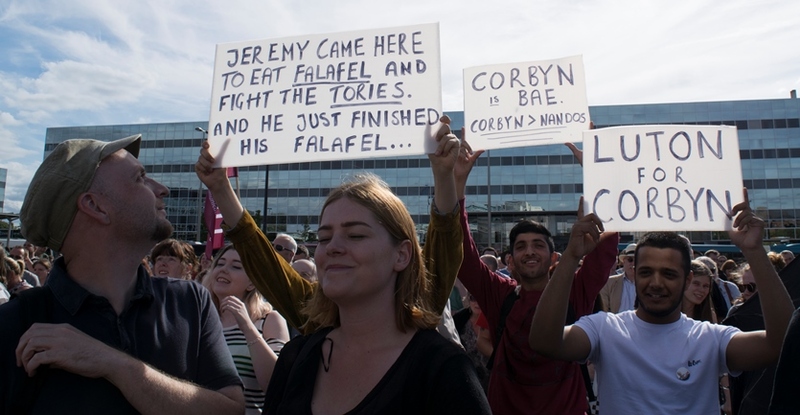 Two members of the Marxist World Editorial Board, one from Northampton and one from High Wycombe, converged in Milton Keynes on Saturday 13th August for the Momentum organised Jeremy Corbyn rally outside the main railway station. It was a well-attended event with at least 500 people. In comparison, a local SWP activist told us that Owen Smith had spoken to a crowd no bigger than 200 at the Open University during the week and many of those were just on their lunch hour and escaping from the office! There were also sizable delegations from local trade union branches, most noticeably the CWU, Unite and the FBU. Corbyn arrived by train and received a rock-star welcome and needed to be ferried the 30 meters or so to the stage at the other end of Station Square, which was on top of a fire engine emblazoned with FBU logos and Marx’s slogan “Workers of the World Unite”! Despite this glitzy showing, he stopped for many selfies with people and acknowledged everyone who addressed him. There were speeches earlier in the day from Diane Abbott, Matt Wrack from the FBU union and other activists. We have to confess that during this period, we were too busy talking to people in the crowd about their experiences and why they were at the rally to hear what was said. Most were Labour Party members, but not just from Milton Keynes. We spoke to members from Oxford, Northampton and High Wycombe who had made the journey to see Corbyn. In view of everything that has been happening in the Labour Party in the last few months, with a new twist almost every day, everyone was very keen to speak and discuss the issues and their own circumstances or experiences, and there was no shortage of conversational political topics. Not surprisingly, there was utter contempt for Owen Smith and the PLP rebels and the decision to waste members’ money on the High court appeal to block new members from voting in the leadership contest. Consequently, our discussions with people were mostly very lengthy, but all the better for it, with some excellent conversations discussing the need for Marxist ideas and socialist policies in the party and introducing Marxist World, the journal and our abridged edition of Marx’s Capital Volume I. Everyone who engaged in conversation was very receptive to our ideas and agreed on the need for more radical socialist policies in the party. No one we spoke to seemed at all shocked or surprised at the raising of Marxist ideas. It seemed like either it was something they had heard about, or been thinking about, or they had a friend or partner who had shown an interest recently. Interestingly this follows on from recent experiences one of us has had where it seems to be increasingly easy and natural to discuss socialist politics in even fairly unexpected places! We also missed some of the speech from Corbyn due to wanting to talk to as many people as possible. What we did hear were pledges to basic human needs such as to abolish homelessness and reliance on food banks. Corbyn, and his crowd of supporters, certainly knew what they were against. There were strong statements on workers’ rights, notably to abolish zero-hour contracts and tribunal costs. He also talked briefly on some of the ten pledges recently made, such as the £500bn National Investment Bank and a wholly publicly-owned NHS. He reiterated that there was no place for private interests in the NHS. Although full of good intentions, it was fairly vague in terms of what was necessary to carry these thing out and, maybe not surprisingly, the words “socialist” and “class” did not feature at all. This seems consistent with his other media showings and other Momentum public meetings. Corbyn made the point that, while we are blaming our neighbours or immigrants for the lack of school or hospital places or the lack of doctors’ appointments, another new surgery, school or hospital won’t get built. He also talked about giving everyone the opportunity to exercise their creative talents and for the arts and participation in them not to be a reserve of the wealthy. There seemed to be broadly two types of people present: an older layer who were mainly active in the Labour Party back in the 70s/80s/early 90s but became disillusioned under Blair, only to be re-energised with the rise of Corbyn, and a younger layer who had entered ‘mainstream’ politics for the first time and were interested to hear what Corbyn was about. All said though it was a very uplifting and encouraging day. We sold a total of ten Marxist World journals, one copy of Capital, plus gained a new contact name in High Wycombe and the name of a person in Northampton who is interested in joining a Capital reading group. Note from SW: To emphasise a point made earlier, on returning to Northampton, I went to my local chippy and was still wearing my t-shirt which has the formula for Marx’s Law of the Tendency of the Rate of Profit to Fall on it. A man in the queue, John, asked me what the formula meant so I explained and also where I had been today. He said it made perfect sense to him and although a slightly surreal moment, it also seemed quite a natural conversation to be having. As John said, Corbyn has managed to engage a whole new layer of people in political discussion which has been lying dormant since the Thatcher and Blair years. It ended with him saying he would think about joining Labour now if that was the direction it was going in. 500 my arse. You playing the BBC game again? The article said “over 500”. Happy to concede the number was probably a few hundred more. We are not trying to downplay the numbers, which you seem to be suggesting. On the other hand, some organisers seem to be exaggerating the figures, but never mind. How about commenting on the actual political content of our report?